I have to admit, this is by far the most accurate psychology test I’ve done. It was so precise and correct, it was scary! Each of us thinks that they know themselves, until we start diving deep into our subconscious and realize the depths of our personality. What we are conscious of is just a tip of the iceberg. We have no idea who we REALLY are! And when someone or something reveals these truths to us we can’t believe how effectively we were blind to them. It’s all so clear in those moments. That’s how I felt after making this psychoanalysis. However, in a day or two we forget about these revelations again and again returning to our old unaware mindset. The ingenious test was designed in the 20th century by the Hungarian psychiatrist Leopold Szondi. The aim was to explore the deepest repressed impulses of a person on the basis of sympathy or aversion caused by the specific photos of psychopaths. The test is based on the general notion that the characteristics that bother us in others are those that caused aversion to ourselves at an early stage of our life and that’s why we repress them. – Repression: According to the psychoanalytic concept, this is the most important psychological defense mechanism we have. Its most important function is to transfer thoughts and desires we are uncomfortable with to our unconscious. – Denial: It is a mental process by which we absolutely refuse our deepest impulses (ie things we want), adopting the exact opposite pattern of the desired behavior. – Sublimation: The process of transfer of our repressed choices, states or behaviors to the ones that are socially acceptable or useful, such as artistic activities, hobbies, professional choices, harmless little habits etc. 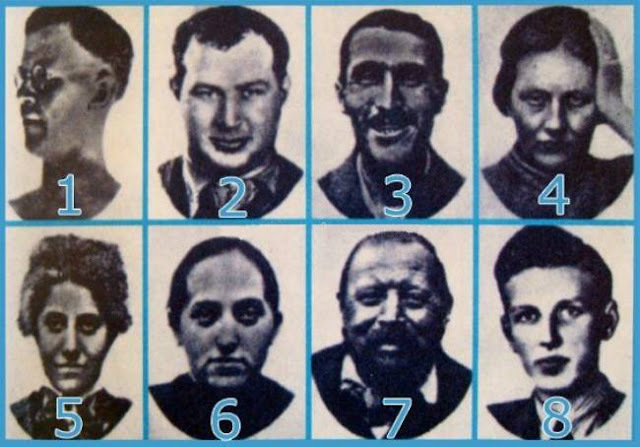 The original test included 6 sets of 8 portraits of people, each of whom had been classified as a sadist, an epileptic, an hysteric, a katatonic, a schizophrenic, a depressive and a maniac. Here is a minor version of the test, which includes only one set of portraits, since it is very difficult to provide the full version of it with all the possible interpretations in one blog post. However, It’s INCREDIBLY effective and accurate! IMPORTANT NOTE: please don’t misunderstand the results of the test, which don’t imply that you have a kind of mental disorder, since the test was designed to make an assumption about the possible repressed impulses of each type of personality in accordance with the psychoanalysis theory. You tend to adopt stereotypical behaviors and do not like innovations and changes. Maybe you’re the type of timid and diffident person, who finds it particularly difficult to adapt to new situations. Your biggest fear is to lose self-control. You are a bit stiff, often defensive and perhaps inhibited person who never deviates from the ‘behavior codex’. This kind of personality is expressed in a person’s desire to live and be accepted as a member of the opposite gender. If this young man seems dangerous and depraved to you, perhaps early in your childhood you repressed an identity problem.